This BSc builds on the core programme offered within the School of Planning (focusing on urban planning and design) and combines it with a focus on property markets, investment decisions and real estate economics. It is accredited by the Royal Institute of Chartered Surveyors (RICS) and recognised by the Royal Town Planning Institute (RTPI). A score of 17 points in three higher level subjects, with no score lower than 5. BTEC Level 3 Extended Diploma (QCF) or BTEC Level 3 National Extended Diploma (RQF - teaching from 2016) with Distinction*, Distinction, Distinction. Successful completion of the WBQ Advanced Skills Challenge Certificate plus 2 GCE A-Levels at grades AAB, plus 2 GCE A-levels at grades AB. This BSc offers students a broad-based education in the built environment with an opportunity to specialise in real estate. It provides students with a route towards professional accreditation by two of the most internationally recognised professional bodies for built environment professionals in the UK (see accreditation above). The Bartlett's strong research track record and links to professional practice will feed into the core and specialist aspects of the programme, ensuring that contemporary challenges and issues in theory and practice are addressed. In addition to the academic activities at the school and across UCL, London offers built environment students an unrivalled concentration of professional meetings, seminars, conferences, exhibitions and events which will greatly enrich your education. The Bartlett maintains an international outlook and provides opportunities for combined study overseas in Europe, North America, Australia and Hong Kong. This BSc, if followed by an appropriate Graduate Diploma or MSc programme, leads to eligibility for professional membership of the The Royal Town Planning Institute (RTPI). After graduation you are eligible to apply for the Assessment of Professional Competence (APC) which leads to full professional membership of the Royal Institute of Chartered Surveyors (RICS). In each year of your degree you will take a number of individual compulsory modules, normally valued at 0.5 or 1.0 credits, adding up to a total of 4.0 credits for the year. Modules are assessed in the academic year in which they are taken. A 1.0 credit is considered equivalent to 15 credits in the European Credit Transfer System (ECTS). The programme is structured carefully to equip students with a coherent understanding of urbanism and the built environment, with a particular focus on the role of real estate investment, development and appraisal. Core modules are structured around the three streams of understanding, managing and delivering urban change, with specialist real estate modules covering real estate economics, management, investment, development and appraisal. Students will become familiar with theories, methodologies, skills, and techniques taken from the social science, urban planning and design disciplines. These aim to develop a capacity for critical thinking, problem solving and creative expression. In the first two years, students follow eight core modules a year, one of which is directly related to the real estate specialism. The others seek to build core knowledge, competencies and skills across the discipline. Students are eligible to apply to study abroad in the second term of year two. In the final year students specialise in real estate, with four out of eight modules covering specialist real estate topics. The School of Planning advocates and employs a very interactive, hands-on form of learning. Alongside lectures, seminars and tutorials we include field visits, group project work, and laboratory and design work sessions to improve your learning experience. Means of assessment are balanced throughout the programme with a combination of individual and group work, essays, project work and other skills-based practical work, and examinations. Detailed course descriptions are available on the department website: Urban Planning and Real Estate BSc. This programme enables you to acquire highly transferable knowledge and skills such as data collection, analysis and presentation, graphic skills, the ability to resolve problems and conflicts, negotiation and mediation, team work and leadership, managing work tasks, preparing and writing professional reports, as well as written, graphic, and oral presentation skills. Graduates will be equipped to take up employment in a vast range of positions within the property and planning professions where their analytical, negotiating and problem-solving skills will be valued. 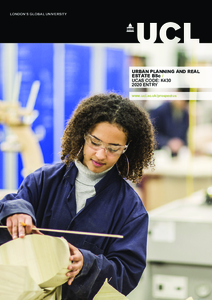 Demand for people with planning skills combined with knowledge of the real estate sector in the UK and abroad is strong. Our students go on to work for a range of employers in the private, public and third sectors, including property companies, surveying firms, planning consultancies, developers, in the civil service, and in local and international non-governmental organisations. Due to the nature of our BSc programmes as a route for eligible membership of RICS/RTPI, it is also expected that many of our students will go on to further study. We will look for evidence of your interest in our subject in your personal statement. We hope to see a demonstrable interest in, and understanding of, the links between urban planning, design and real estate, as well as an ability to write coherently, communicate effectively, and think critically. You will also be expected to demonstrate evidence of your numeracy skills and we will assess your use of English. Shortlisted applicants living in or near to the UK will be invited to an applicant open day. This will typically include an introduction to UCL and the School of Planning, a presentation on UCL accommodation and finance, a taster lecture delivered by an academic in the School of Planning, lunch and a tour of the campus with current students, and an interactive Q&A session with members of staff and current students. You may be asked to submit an essay in support of your application. We welcome applications from people with non-standard qualifications, including mature students with relevant study or work experience. Please contact us if you need further advice about the acceptability of non-standard qualifications.